Suspension Revolution 2.0 will show you how to burn fat and build muscle. 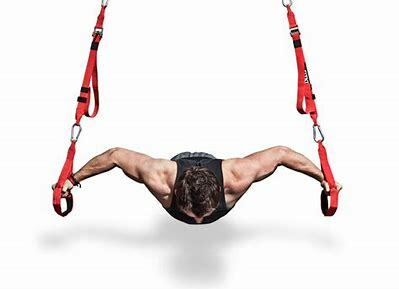 There are 27 intense workouts and 191 amazing suspension exercises that will help you accomplish your fitness goals. The 4-Week Suspension Beginner Revolution course will start you off by showing you how to wake up your muscles and get ready for the intense workouts to follow. Once your muscles are ready to take on the challenge, the 4-Week Suspension Intermediate Revolution portion of the program will help you progress to new and progressive exercises and workouts to avoid the plateau and bring on a new stimulus. The 12-Week Suspension Advanced Revolution course is where things get real. This is the portion of the program where you start burning your fat. This is the course that you’ve been working up to. May the odds be ever in your favour. You’ll also get the ebook Suspension After-burn Finishers, which tells you how to get advanced results in less time. This will show you exercises that you can do after your workouts, or just in your spare time. The icing on the cake, if you will. Suspension Revolution 2.0 also comes with a bonus video called The Top 10 Suspension Exercises that No One Else Does. These 10 suspension exercises will help you discover a whole new body-transforming world that you’ve never seen before. You’ll burn even more fat with this video because it will force you to work muscles that you didn’t even know you had.